That is an excellent question and we have quite a few. Please follow this link to see our Terms and Conditions. What is your Price Matching policy? We will price match the price of any frame, prescription lens, or contact lens of our competitor. To get your Price Match completed we will need a link to the item in question. This way we can review that the item is lower in price, currently in stock, and offered by a legitimate retailer (as determined by us). Please know that coupon codes and special offers cannot be combined with our Price Matching methods. Returns must be in the entirety of the order and in resalable condition for the return to be accepted. That said, we really want you to like your order. That's why we offer full refunds on all returns but prescription lenses (which are custom made and cannot be refunded). Frames: Our top priority is for you to love your glasses. That's why you have 30 days from when you receive your frames to return them to us, regardless of the reason, for a full refund. If the glasses are received in resalable condition, you'll get a 100% refund. Contact Lenses: You can return any unopened, undamaged, unmarked boxes to us for a full refund within a year of your purchase date. Lenses: As lenses are custom made to your prescription, coating choice, and then cut to the shape of your frame, we cannot accept returns on lenses. However! If you feel there is a manufacturing error, we will accept the return and if our inspection shows that they were incorrectly made we will remake them for you for no charge. Contact us to let us know that you want to return something. Make sure you include everything we sent you (case, cloth, box, paperwork) and make sure that these items are undamaged and in good enough condition to resell. Add a brief note with your order number on it. If shipping back from the US, please us the United States Postal Service and comment on the shipment: "Customs code Canada 9813". The moment we have received your return we will process it and get your refund going. Funds returned to your purchase method can take 24-48 hours to reflect in your account. We accept credit card, PayPal, store credit, and FuturePay. The credit cards we accept are: Visa, MasterCard, Discover, and American Express. Your prescription is called an Rx for short and it contains a series of values that an optometrist measures to correct your vision with corrective lenses – either eyeglasses or contact lenses. Your prescription will come as a table with two rows a series of columns. The top row is always the right eye and is called the OD. The second row is always the left eye and is called the OS. Each row of the prescription has several sections Sphere (Sph), Cylinder (Cyl), Axis, and ADD. The sphere is to correct for nearsighted and farsighted vision. The Cylinder and Axis correct for astigmatism. Lastly, the ADD is for progressive vision where glasses provide magnifying power to aid in reading or up-close viewing. Or, if you would rather some real-time help, join us on our Live Chat. Live Chat is available Monday to Friday (9am - 4pm PST). What do the numbers inside my frame mean? The first set of numbers inside the temple arm are the manufacturer’s model number. Farther down the arm come the dimensions in millimeters with eye size, bridge width, and temple length. The greater the lens index the thinner the lens. Also, more complex prescriptions require a higher index of lens to keep the lens thin and free from distortion. We offer six different indexes from our 1.5 index free lens to the 1.74 index lens that is as thin as possible. 1.5 index are conventional standard lenses and come free with any frame purchase. They are suitable for prescriptions of +/- 2.00 or below. They can effectively correct a CYL of +/- and below. 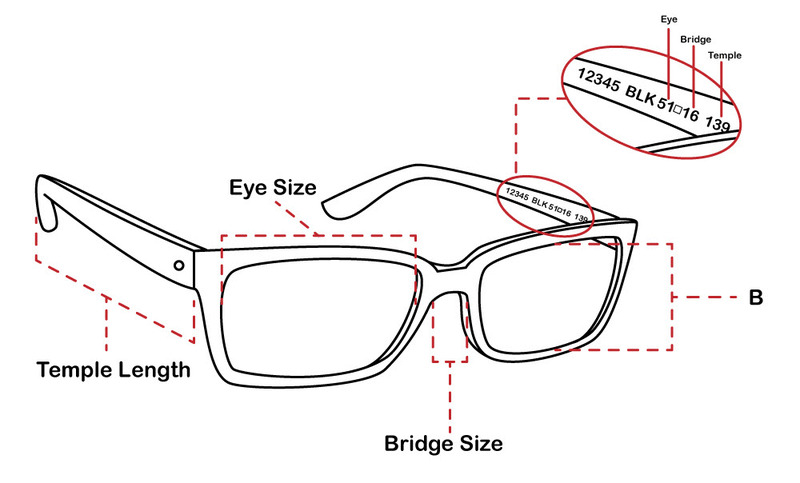 1.57 index lenses are thinner than the 1.5 index and can handle sphere corrections of +/- 5.00 and below. As well as, CYL corrections of +/- 3.00. 1.59 index are polycarbonate lenses and are the most impact-resistant option – making them the most suitable option for children's glasses. 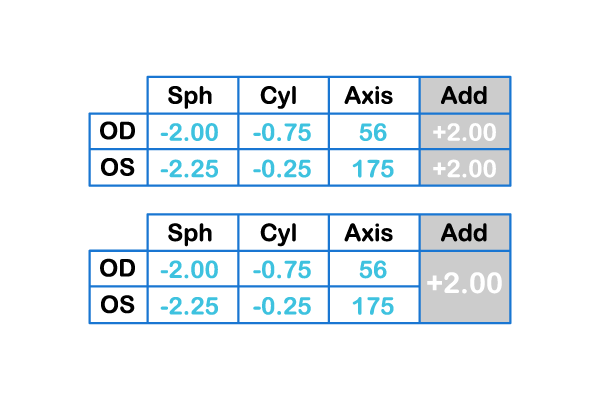 1.6 index lenses are thinner than polycarbonate lenses and are recommended for sphere corrections of +/-6.50 or below and CYL corrections of +/- 3.00. 1.67 index lenses are for corrections of +/- 9.00 or below and CYL corrections of +/- 4.00 or below. 1.74 index lenses are the thinnest possible lenses and handle the highest prescriptions. They are for corrections of +/- 9.00 or greater and for CYL corrections greater than +/- 4.00. Do you have a Live Chat? Our Live Chat is available Monday to Friday from 9am to 4pm (PST). If you are outside that time frame or cannot connect to an operator, please send us a Help Ticket by email us at Info@acmeeyewear.com. Do you have transitions and photochromatic lenses? We carry photochromatic lenses in several varieties from signature, extra active, and transitions – which are designed for driving. Transitions and photochromatic lenses are treated to darken on exposure to UltraViolet (UV) light radiation. When inside, and in the absence of activating light, these lenses return to a clear state. Do you sell reading glasses? We certainly do and boy are we proud of it! AR: Anti-Reflective – a type of coating that reduces reflection on the lenses. AXIS: The angle the Cylinder (CYL) is placed on a lens to correct an astigmatism. It ranges from 1 – 180. CYL: The Cylinder – with the AXIS, the CYL corrects for astigmatism. DS: The abbreviation for diopter simplex. An optician or doctor may write DS on an prescription if that field requires no correction. OD: Latin for Oculus Dexter, meaning the right eye. OS: Latin for Oculus Sinister, meaning the left eye. OU: Latin for Oculus Uterque, meaning each eye. PAL: Progressive Addition Lens – sometimes on a Progressive prescription an optician or doctor may two different numbers for the ADD to increase the reading power for Progressive lenses. PD: Pupillary Distance – the distance between your pupils. This measurement is needed to place the optical center on each lens. PL: Plano, which is Latin for flat. If this is in the Sphere section of an prescription it means no correction is needed. Sph: The first section on an prescription that shows the correction for nearsighted or farsighted vision. UV: The abbreviation of ultraviolet light. What if my frames don’t fit? Please contact us if you aren’t completely happy with your frames. If the frames fit but you just don’t like the size of them, you may return the glasses for a refund or store credit so you may order new pair of glasses. All we want is for you to be happy. What do you Price Match? We price match everything. That means you may price match frames, contact lenses, and prescription lenses. Moreover, if something goes on sale within 30 days of your order date we will adjust your payment for the difference. All in all, we just want you to be happy and confident with your order. LED screens of TVs, computer monitors, and smart phones produce lots of high-energy, blue-spectrum light. Exposure to such high levels can lead to eye strain, fatigue, and suppress the production of sleep-promoting melatonin. Blue Blocking lenses and coatings filter out the wavelengths in the blue part of the light spectrum. This makes Blue Blocker ideal for those frequently in front of a screen. My frames are outside of warranty, how do I get a replacement? We would be happy to provide you a replacement frame for 50% off. Just contact us and we will work with you to get that replacement frame! If you are ordering frames or lenses we sure do! But we do require that customers outside of North America use PayPal to complete their purchase. We do not, on the other hand, sell contact lenses outside of Canada. At this time contact lenses can only be purchased by Canadian customers.